Tsubasa Kaiiro: Childish father, but responsible and caring. Died in an accident with Inoko. Inoko Kaiiro: Responsible, and gentle mother. Died in an accident with Tsubasa. History: When his parents were killed in a large accident, dying instantly, he had nowhere to go. He needed to fend for himself so he learned fencing, as well as worked as a personal servant for the Thorne's Cassandra, quietly falling in love with her. Extra Information: He became a hunter merely to protect Cassie, as well as calls her nothing but "milady." Hair color/style: Fiery red, usually left down, or put in a loveknot. History: Lily was born from a wealthy family, her mother a famous fashion designer and her father a history teacher at a well-to-do school. When she received the letter to attend the elite school that most young middleschoolers would dream of, she started packing immediately, excited at the opportunity. * Slight OCD - she tries to control her urges to straighten items. Such as picture frames, random items on a table, etc, and constantly checks to make sure the stove/etc is turned off. 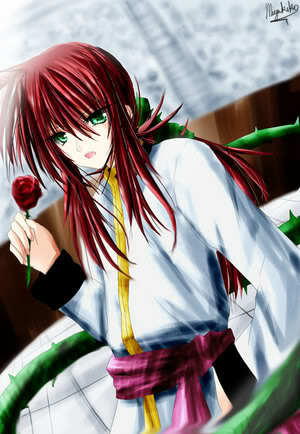 * Fiery Temper - She has a long fused temper, but when it blows, its like a firecracker. * Obsessive - she can be obsessive over small things, and even when her friends drop it, she won't often, though she obsesses over it by herself and won't say anything about it unless she's reached a conclusion. * Forgetful - Her brother Loki says that she'd lose her own head if she didn't have it attached to her neck! * Intense - Can be too intense for certain people - she's like a miniature sun! She has two cute cats, one white and one black, named Miffs and Mitts and has a white horse named Starlight. There are a couple of things that concern me. Her age. There are three "high school; female" slots already filled. There are spots for middle school and elementary school slots. The vice president, Harmony(BloodxXxDark) is inactive and may want to change her character to an NPC(Which is what I'm changing Creselia into, I don't want her dead anymore) so you MAY be able to take that spot. You will have to wait for a while. She's not my character. Does she wear her uniform twenty four seven, or the uniform in the picture? Some students like nice and simple attire because they live in a school with monsters, it has to be easy to move it(It doesn't have to, but you would want that, right). Where's her history? What happened to her when she was young? How she reacted when she was invited to this elite high school? If her cats are in the school, please keep to a minimum. I don't like the idea of pets in the school, but do accept it. Please look over the rules once more. Sorry, I guess I might have rushed through it a bit. Okay, I can make her a middle schooler, probably an eighth grader. 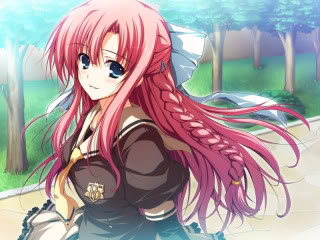 And yeah, she normally wears her school uniform even when she doesn't have to. The school uniform. And I'll add the history - also, the cats can be at home. Thank you, her changes seem fine now(She'll be taking over Cecilia's place). There is still something missing. Have you checked the rules once more? I'm not sure....sometime in the winter, perhaps? That depends on who's asking. I don't like accocating with other people. That is for me to know. For as long as I need to. I don't know such a feeling. When you the last time you got slapped? My tear glands have long since dried out. If i told you, would you destroy me? I have none. Though my mother called my "Alyce"
Hero? You've got me twisted. I'm delaying the next day. 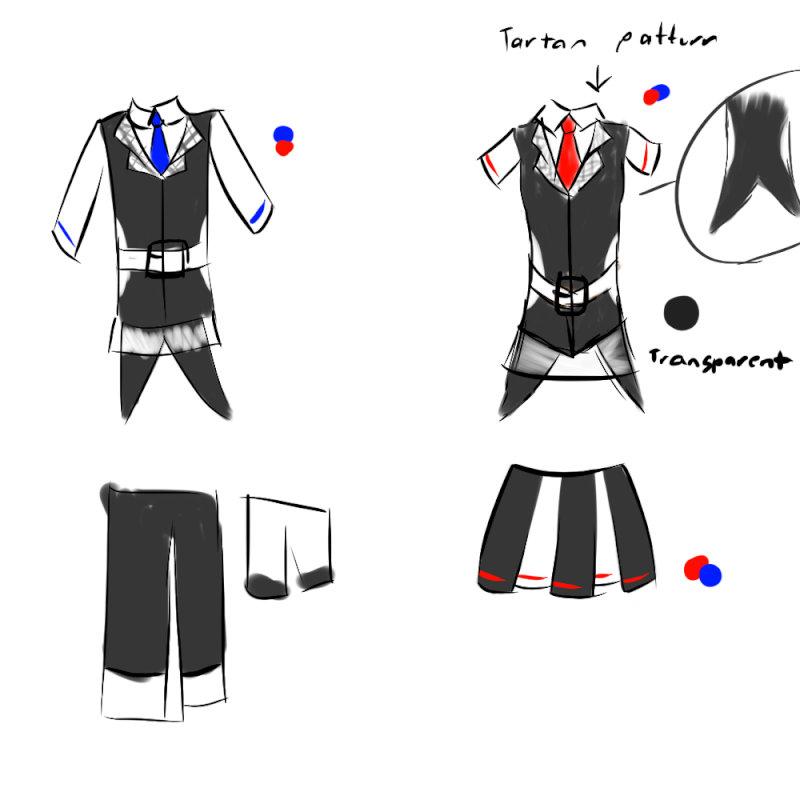 Anyways, for you guys to start thinking, here are doodles of the uniforms for the debate(I might redo them because the're really sloppy). Alice will do one, too! How intimate(vulgar)! No thank you. I can't say that I've tasted it. Well I read this book with these creatures(The Silence. And yes Doctor Who is a book XDDD) who you forget about after you look away from them. In the 60's, a man wanting to get rid of the silence, planted a subliminal message into the moonlanding video, ordering a subliminal execution of them. So I may have killed many and forgotten. I don't believe anyone has done anything to make me loathe them. Winter. It's so festive! Along with a book, a blanket, and a seat near the fire, it is most wonderful. Do my books count as bosom friends? Tea.us Green tea. It is a bit bitter, though. Blood is still pulsing through my veins! I find myself to be kind. I am not very elegant or classy with people of this era, so I am shy. Father spoils me far too much, mother raises me humbly and strictly. They balance eachother. My odd phobias. Glass Doorknobs...they terrify me. Mother says swimming is wrong. So Not very long. When I was just a baby, I assume. Glen Miller and his orchestra. How dare you ask a woman about their mental health! A young woman. While outdated, I am raised well. ...Princess Montgomery. The neighborhood children called me that. Hero? One of the women in Ww2 would be just fine. May I ask what a sleepover is? I'm redoing the scribbles for those uniforms but here's the catch... I have to make two new pairs of uniforms as well. Why? 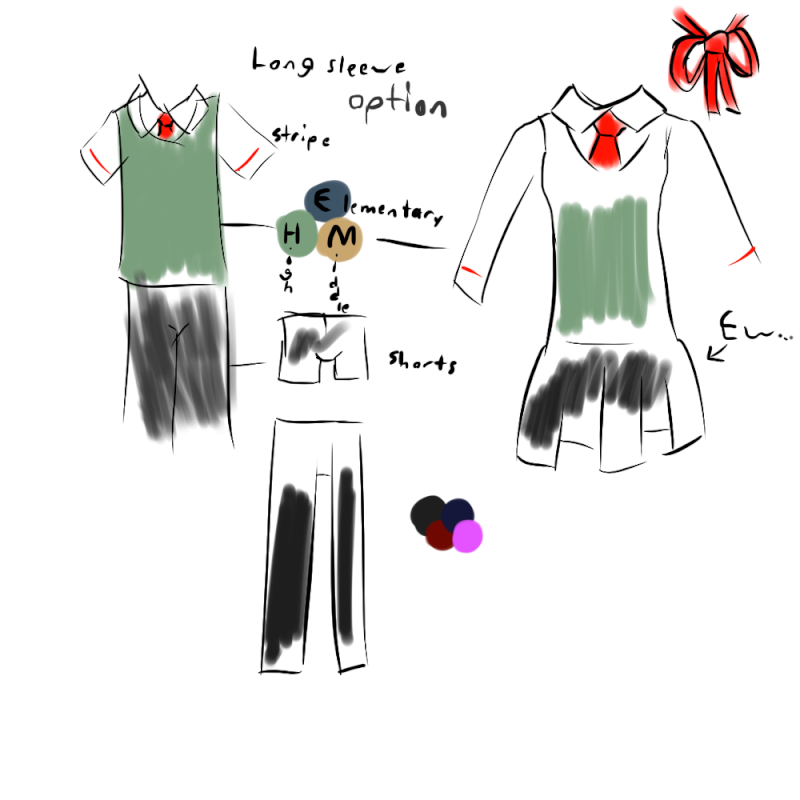 But I'm going to make some new uniform designs. ALSO, I might another three pairs for alternate uniforms. Take note that these will be the main uniforms(if chosen) but your character can still wear the old uniform if wanted(Though these ones are better). For the assembly, I've had an idea and because this little gathering has a lot to do with the new uniforms, we'll need some models. With a random chooser online, here are the models. If you don't want to do this, tell me and I'll give your position to another person. 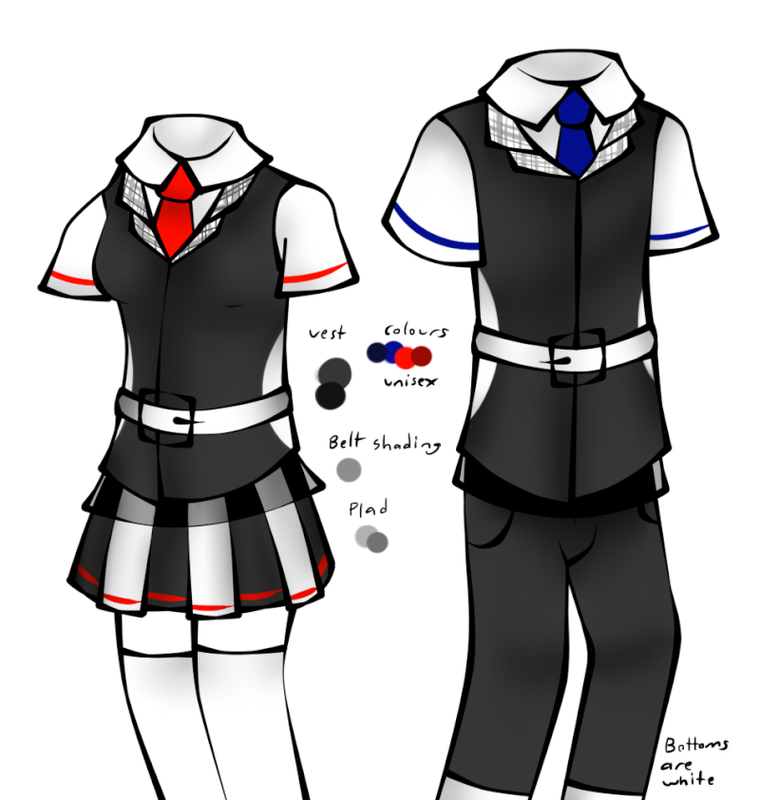 Here are the updated school uniform references. They have the same designs as in the scribbles but are more organised. Now with the old uniforms, they were the same for each scholarship. For the new uniforms, there are different ones for different scholarships. College students wear the high school uniform as well. Female: A light sweater vest with a normal skirt. Have the option between a red tie or bow. 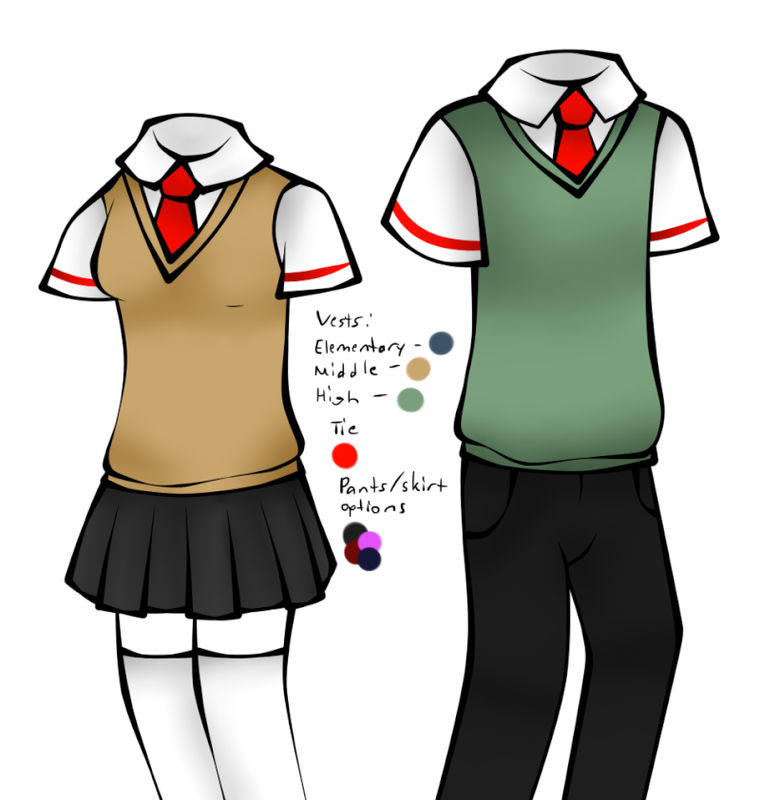 Male: A sweater vest with either shorts or pants, as well as a red tie. Both: Are colored by their scholarship point with green for high school, beige for middle school, and blue for elementary. Students have the choice of their skirt/pants color between blue, back, pink, and red. 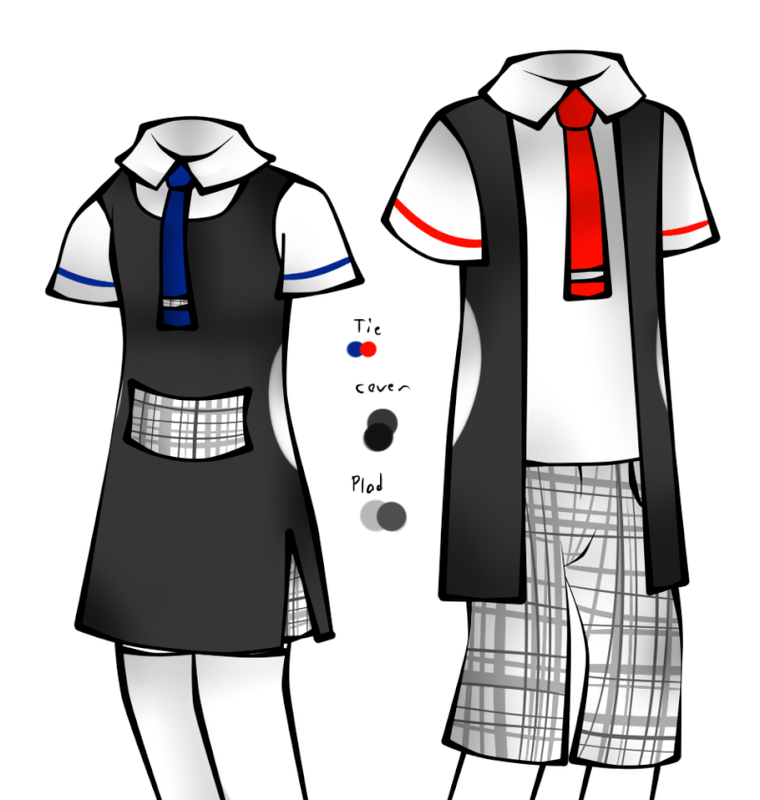 Female:White and black skirt with blue or red rims, as well as a white shirt. Male: White shirt with black pants with white rims. Students have a choice for shorts as well which are wite with black rims. Both: Red ties. The vest has a belt around it with two circles on the side that are white, as well as the choice of blue or red. The vest has a plaid design inside. The long white shirt is see through waist down. Female: A white dress underneath a small vest. Male: White shirt with plaid rims, as well as a small vest and pants. 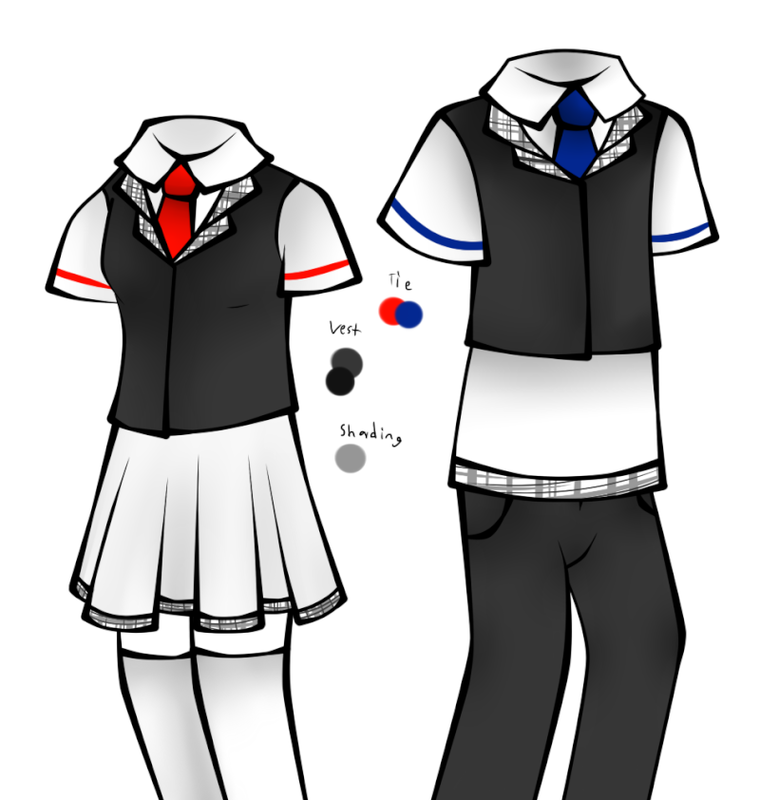 Both: Plaid rims with the black vest and a choice between the colors of red and blue. Female: Black jumper with a plaid pocket in front. Male: A white shirt with plaid shorts and a cover up that's black. Both: Short tie with the choice of blue and red. Saying that, I'll probably be gone in a few days again, so I'm practically giving Milly premission to use my character when ever I'm not here, no need to keep people waiting. NOW I WAN TO DRAW THE OTHER TWO *cough* I'm not sure how you're planning the whole "modeling" thing, but if you want t draw them I could split up the work with you and do some of them. X3 Thanks for the offer, Afs, but it's okay, I can handle it. Guys, I've been thinking about making a forum for this, for a couple of reasons. I like it here on HD but it seems some of us want more detail with this, more fights with that, less drama here, more gumbo there, you know? I don't know what gumbo is, sorry. So people could do what they liked. Someone could be fighting a monster while others aren't and the roleplay could go on easier. Thing is, whenever I do something like this, it dies right away... I'm still debating. Okay. X3 (Good thing I didn't start James @_@ I would have DIED).